Click book cover to watch 2 minute video. Click one of the above links for purchase. M&E Training: A Systematic Approach was published in 2016 to wide acclaim. 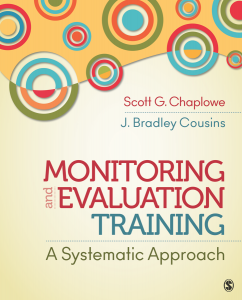 Coauthored by Scott Chaplowe and Brad Cousins, this comprehensive 439-page book bridges theoretical concepts with practical, hands-on guidance for successful M&E training. The authors draw upon their combined 50+ years of practical experience and scholarly research on M&E training, adult education, participatory evaluation and evaluation capacity development in a variety of international contexts. The book is organized into three parts which progressively build upon each other. Illustrative examples, practical checklists, feature boxes, diagrams, and other visual aids like cartoons, provide clear and accessible guidance that can be tailored to different M&E training needs and contexts – whether training is for beginners or experienced learners, organizations or the general public, or for one-day or long-term training programs. Readers can easily navigate contents according to their level of understanding, interests and needs. To assist with this, each chapter begins with a brief a summary of learning objectives, ends with a summary of key learning points, and includes a list of resources for further learning on chapter topics, (most freely available online). Part 1 provides a conceptual foundation for M&E training as part of a larger system that includes other sources of learning and media for its delivery, the learners themselves, the trainers, and other contextual considerations that can support or hinder training outcomes. Training does not happen in isolation, and is best planned as part of a coherent, holistic approach to learning and transfer to achieve individual and organizational objectives. Chapter 1 provides an overview of the book and the choices we have made for the topics included and how we discuss them. It identifies key factors of successful M&E training, such attention to training transfer, and approaching training both systematically as well as systemically. The demand for M&E training is discussed, including the range of M&E training types, providers and trainees. A copy of this chapter can be accessed here. Chapter 2 begins by examining what distinguishes training relative to other forms of education, situating it within an education continuum spanning formal, non-formal, informal and incidental learning. The discussion reinforces a systems approach to M&E training, stressing that it typically occurs in contexts where multiple other sources of learning are available. Thus, particular attention is given to the assortment of delivery media (possibilities) for learning in addition to in-person training, such as e-learning, on-the-job training, mentoring, and the use of social media. Such considerations are critical to make informed decisions that best cater to training needs. M&E training does not happen in isolation, but is embedded in complex social systems that affect training and its outcomes. Chapter 3 situates M&E as part of a larger system, with key considerations at the levels of the individual, organization, and external environment that shape the supply and demand for M&E capacity building. The chapter ends with looking at M&E capacity assessment and strategic planning to inform capacity building investment and alignment. Adults are self-directed learners, bringing to training past experiences, values, opinions, expectations and priorities. They are indeed complex systems, and no one explanatory model or theory is fully satisfactory. Therefore, any attempt to summarize such a topic as adult learning is far from exhaustive. Chapter 4 provides an overview of some major adult learning concepts and considerations for M&E training, and concludes identifying 14 adult learning principles that were carefully researched and selected for effective M&E(or any) training. Chapter 5 – What makes a good M&E Trainer? M&E trainers wear several hats and play a variety of roles in addition to training facilitation. This chapter identifies key competencies for M&E trainers, grouped into 6 core areas. An understanding of these competencies can help inform trainer recruitment, professional development, performance appraisal and management, and curriculum development for training of trainers (ToT). The chapter ends with guidance for recruiting an M&E trainer, with an example recruitment checklist. A copy of this chapter can be accessed here. Part 2 of the book provides practical guidance to systematically plan the effective delivery and follow-up to M&E training, the overarching goal being the transfer of learning into individual and organizational practice. It presents a systematic approach for M&E training, from training analysis, design and development to its implementation and evaluation. Practical examples, checklists and other tools accompany each chapter. This chapter introduces the five interrelated phases of the ADDIE framework for training: Analysis, Design, Development, Implementation, and Evaluation. It discusses ADDIE as a systematic and systems approach to training, and why it was selected for M&E training. Training analysis gathers information to determine whether M&E training is needed, and if so, how to best provide it. Therefore, this chapter examines more than needs analysis, but also solution analysis, with careful consideration of opportunities and available resources, as well as threats and constraints. Key topics include: training needs and outcomes analysis; trainee analysis; context analysis; task, gap, and causal analysis, and training analysis reporting. Training design builds upon the information gathered during the training analysis to define specific training objectives, content and instructional design (curriculum) to deliver training to achieve intended results. This includes the selection of methods, activities and training materials most suitable for the specific M&E training needs, audience, resources, and instructional setting identified during the analysis stage. Key topics include: identifying training and learning objectives; organizing instructional content; and designing training curriculum, evaluation and follow-up. The time, responsibilities, and what exactly needs to be developed for an M&E training event will vary according to its particular design. This chapter first examines considerations for materials to develop, adopt or adapt for M&E training. These resources need to be carefully reviewed and can be piloted when appropriate. Next, the chapter looks at practical logistics for successful training implementation. The chapter includes comprehensive checklists for preparing for M&E training, as well as example outlines for training plans, syllabus and more. Training implementation operationalizes what has been designed and developed to achieve training objectives. It is when learning occurs, which involves various activities where people interact with training content and each other, experiencing, practicing and reviewing M&E concepts and practices. For the trainer, this involves the management of training activities, participants, the training environment and the overall learning process. Key topics covered in this chapter include: effective communication and use of questions; using training aids; facilitating discussion and group dynamics; training monitoring and feedback; co-facilitation; cultural competence; handling disruptive behavior; time management; and specific tips for training introductions, activity facilitation, and closing. Training evaluation should be carefully considered early during the training design and development (Chapters 8 and 9). This helps to ensure that training objectives are aligned with measurable results, and assessment tools can be prepared beforehand. After examining training effectiveness and worth this introduces two major approaches to training evaluation: 1) a levels approach, drawing upon the models offered by Kirkpatrick and Guskey; and 2) a logical framework approach identifying how resources and planned activities are to bring about intended results, and key indicators for monitoring and evaluation. Next, key considerations are summarized for five generic stages training evaluation, and the chapter concludes looking at four types of evaluators to consider for training evaluation. Successful M&E trainers require an arsenal of methods and techniques they can use in and adapt to multiple and varied training contexts. Part 3 of the book profiles 99 examples activities, organized into 21 categories of activity types (summarized below). Each activity category defines the activity type, its link to adult learning principles, key advantages and disadvantages for the activity, and tips and additional considerations. This is followed by practical, concise descriptions of activities – 99 total – that concretely illustrate methods and techniques for the activity type, and are intended to be tailored to different training contexts.